Polished Concrete is the fastest growing concrete flooring solution to hit the market, businesses across the nation are opting for this innovative, economical, and environmentally friendly floor. 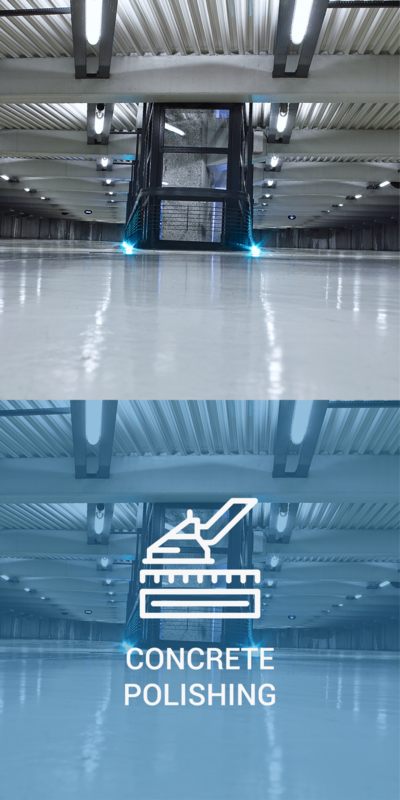 Polished concrete works exceptionally well both in the commercial and industrial facilities providing a durable and long lasting floor that can withstand the high traffic and constant wear of an industrial factory while at the same time saving costs and maintenance fees. Stained Concrete can enhance the appearance of your concrete. Using the latest in concrete color staining technology, we can achieve the color and design you desire. This will in turn give you the beauty and uniqueness of stone with the durability of concrete. Sealing is essential for protecting a concrete floor. This is done with a special coating system which creates a surface that provides protection against chemical spills, deterioration, contamination, and moisture vapor emissions. Sealing provides non-skid and slip resistant characteristics that help protect against costly workplace falls. Densified Concrete helps seal concrete into a base that is solid and less permeable. The densifying action hardens and strengthens within the concrete, protecting it from deterioration. This in turn produces a floor that is resistant and durable to traffic. The benefits of densification is that the surface actually self polishes, leaving you with a beautiful floor and surface that will save you time in maintenance. Concrete joint fill is used to optimize the performance of concrete floor in retail spaces and in industrial warehouses. There are two different types of joint fill; Control Joint Filler and Concrete expansion Joint Filler. We will help you pick the right one based on the needs of your space.